After a year that brought mixed results for Bangor’s retail and commercial scenes, city officials are hoping some recent success stories will set the tone for 2019. Even as the Bangor Mall remains among the city’s largest taxpayers and some key tenants have renewed their leases, it had a turbulent 2018, losing one of its anchor stores and seeing its appraised value cut by 22 percent. But there are strong signs elsewhere in the city, such as high occupancy along the Stillwater Avenue retail corridor, and the expansions of Bangor Savings Bank, Pineland Farms Dairy Co. and ice manufacturer Getchell Brothers Inc.
As city leaders look to 2019, they’re feeling buoyed by those developments while also considering what they can do to revitalize the mall. The Bangor Mall celebrated its 40th birthday in October, but that milestone was eclipsed by more ominous developments in 2018. 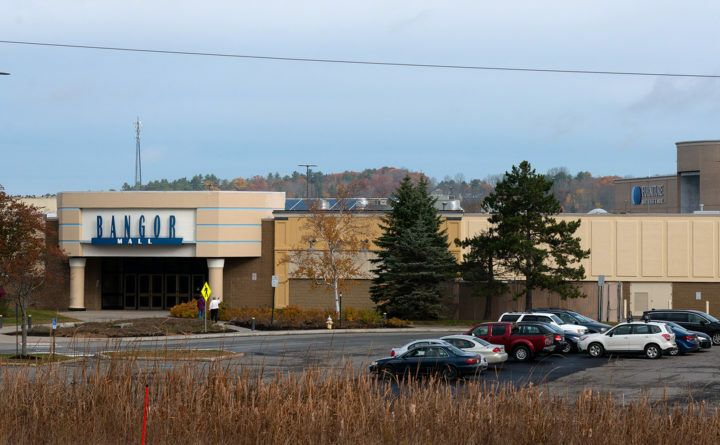 It lost its Sears anchor store earlier in the year, and a city appraisal found its property value had plummeted 22 percent, to $47.3 million as of April 1, 2018, from $60.9 million a year earlier, according to the Bangor city assessor’s office. The mall is still appealing the 2017 assessment, arguing for a lower value that would result in a property tax refund. Also, late in 2017, the mall’s primary owner defaulted on an $80 million loan it had taken out against the mall. Another large vacancy came to that area early this year, when the Toys R Us on Bangor Mall Boulevard closed after the company filed for Chapter 11 bankruptcy protection, leaving a vacant retail building. The neighboring building that housed Kmart and Hands of Hope Thrift Store also remains partially empty, save for the Bangor Market Bazaar that opened in the fall on weekends. The decreased valuation of the mall properties led to a $400,683 drop in the amount of property tax it owed to the city, from $1.6 million in fiscal year 2018 to $1.2 million in 2019, according to city figures. Still, the mall and surrounding retail areas have had a handful of bright moments in recent years. Two of the mall’s major remaining tenants, J.C. Penney and Hannaford, renewed their leases this year, while a new one, Furniture Mattress & More, is now leasing a space once held by Macy’s — although that particular space is not technically owned by the mall. A Texas company that was appointed to work as a receiver for the mall plans to keep operating the property as a retail destination. Some other local businesses and organizations also have become new tenants of the mall in the last few years or are close to doing so, diversifying the mall’s tenant base. Those tenants include Ten Bucks Theatre Co., House 27:4 Church ( formerly CityReach Church of Bangor) and Dream Dress Bridal. What’s more, the city is not overly dependent on the mall for tax revenue or jobs. In 2017, it accounted for less than 2.5 percent of the city’s overall property taxes, and it’s no longer one of the city’s largest employers, according to an annual city report. 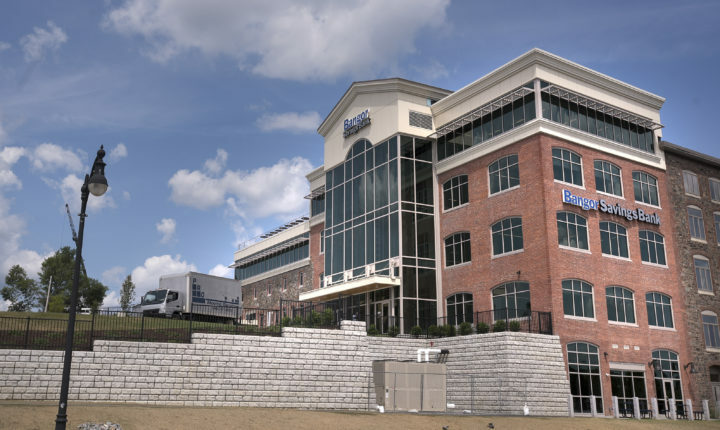 Along with a bump in residential property development this year, business developments such as Bangor Savings Bank’s new $35 million waterfront headquarters expected to be completed in 2019 and other business expansions have grown the city’s tax base, helping to offset a decline in revenue from the mall, Conlow said. Bangor Savings Bank opened its first of two office buildings in early July on its waterfront campus. As 2019 approaches, Bangor officials are considering several approaches to attract new business across the city. They’ve hired a data analytics company, Buxton, to help them recruit businesses to come to the Queen City. “We hope this work will help us attract new retailers to the mall area and to Bangor as a whole – be it Broadway, downtown, Union Street, or Main Street,” Tanya Emery, the city’s economic development director, wrote in an email. Officials are optimistic that the Texas company now managing the mall “will bring renewed focus to the leasing strategy and capital investments that might help renew interest in the mall itself,” Emery said. City councilors are also open to reviewing the development codes in the area around the mall, as the current rules might not suit the types of businesses that would consider moving there, Conlow and Emery said. Even as the mall area has experienced troubling declines this year, downtown Bangor continues a steady trend toward slowly increasing property values and consistent occupancy of most storefronts — with a few exceptions. Notably, 2018 saw sales of several large, prominent downtown buildings, two of which were sold to local Bangor developers. 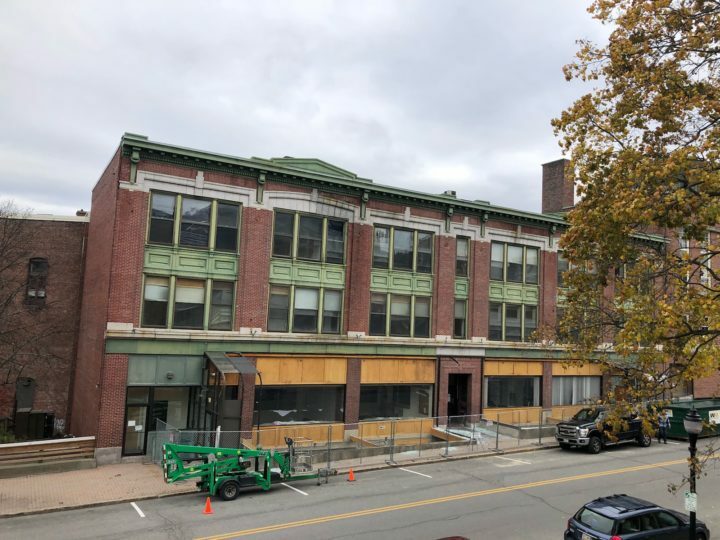 They include 1 Main St., at the corner of Main and Hammond, currently occupied by Umami Noodle Bar and several apartments, which was sold to Bangor property developer Louie Morrison, who intends to renovate the entire building. 29 Franklin St., the former home of Northeast Occupational Exchange, was sold to local business owners Abe and Heather Furth, who intend to turn most of the building into loft apartments and put a commercial space on the street level. The exterior of 29 Franklin St. in downtown Bangor, as seen not long after crews removed the glass atrium over the front entrance. 80 Exchange St., the tallest building in downtown, was sold to Portland-based developers J.B. Brown & Sons over the summer; it is presently home to a branch of Camden National Bank, as well as the Bangor offices of Dead River Co. and Eaton Peabody. Others, such as 2 Hammond St. and 31 Central St., are still for sale. As far as the general business health of downtown goes, 2018 was largely a continuation of developments seen in previous years. Though several notable downtown businesses closed, including Maine Cloth Diaper Co., Friar’s Bakehouse, the Maine Holistic Center and Retro Swagger, a number of others have opened, including Queen City Cinema Club, Black Bear Brewing Co., Accents Home Furnishing & Decor and Three Graces Tattoo & Piercing. While the city does not keep records on occupancy rates year to year, downtown Bangor coordinator Betsy Lundy said the number of occupied buildings in 2018 is roughly on par with what was seen in 2017.